Joshua A. Barro is an American journalist who currently contributes to New York magazine as a business columnist. Barro is the son of Harvard University professor and macroeconomist, Robert Barro. After growing up in Massachusetts, Barro received a bachelor's degree in psychology from Harvard University. While in college, he spent a summer interning for Grover Norquist. 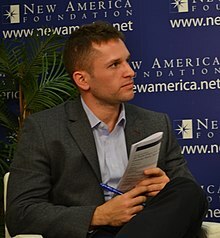 Barro previously worked as a senior fellow at the Manhattan Institute for Policy Research, as a real estate banker for Wells Fargo, as the lead writer for the Ticker, an economics and politics blog hosted by Bloomberg L.P., and as the politics editor at Business Insider. He appears regularly on Bloomberg Television and MSNBC and has appeared on Real Time with Bill Maher on HBO and on All In with Chris Hayes on MSNBC. He is currently the host and moderator of the weekly political roundtable radio show Left, Right & Center, based at KCRW Los Angeles and heard on public radio stations across the U.S. In early 2013, he was a prominent supporter of a potential trillion dollar coin, but by late 2013, he had changed his mind. Time named Barro's Twitter feed one of "The 140 Best Twitter Feeds of 2013," one of ten in the Politics category. In 2012, Forbes selected him as one of the "30 Under 30" media "brightest stars under the age of 30," and David Brooks listed him as part of the "vibrant and increasingly influential center-right conversation." A former aide to Barack Obama included Barro on a short list of Obama's favorite columnists. In 2014, Barro left Business Insider to join The New York Times' "The Upshot." In 2016, Barro was again hired by Business Insider as a senior editor. In 2018, he left Business Insider again to become a business columnist at New York magazine. Early in his career, Barro described himself as Republican but criticized many policies. He also identified as a neoliberal. Barro has been opposed to traditional Christian beliefs regarding homosexuality, stating that they "linger and oppress" and must be "stamped out ruthlessly". After the 2012 United States elections, Barro became increasingly critical of the Republican Party and wrote that "the party’s economic agenda, as embodied in the latest Ryan budget, is simply terrible for the vast majority of Americans." Barro called Congressional Republicans "crazy and awful". Reactions by other conservatives in the media led The Atlantic to name Barro "the loneliest Republican." Ezra Klein said that based on Barro's views, "He doesn't come across as much of a Republican." On October 11, 2016, following the Republican Party's nomination of Donald Trump for president, Barro said he had left the Republican Party and registered as a Democrat. Barro cited as reasons for his decision the "fact-free environment so many of its voters live in, and because of the anti-Democrat hysteria that had been willfully whipped up by so many of its politicians," which created a "vulnerability in our democracy." Barro used the term hamburger problem to criticize the perceived tendency of some progressives in the United States to hassle people on their personal choices. For example, eating meat hamburgers can be criticized based on the arguments that it is harmful for animals, it contributes to global warming and it is unhealthy. Barro lives in Manhattan and identifies as gay. In 2017, he married Zachary Allen, chairman of TIPAH Consulting and a former Democratic National Committee official. He is also an atheist. ^ a b Chait, Jonathan (June 2013). "Josh Barro, the Loneliest Republican". The Atlantic. Retrieved August 10, 2015. ^ a b Barro, Josh. "Josh Barro bio". The New York Times. Retrieved July 28, 2014. ^ a b c Eidelson, Josh. "GOP is "crazy and awful": The Josh Barro Republicans are displeased". Salon. Retrieved October 7, 2016. ^ Barro, Josh. "Josh Barro bio". Bloomberg. Retrieved March 26, 2013. ^ Byers, Dylan (May 29, 2013). "Josh Barro to Business Insider". Politico. Retrieved May 29, 2013. ^ Feldman, Josh (February 9, 2013). "Bill Maher And Panel Take On Drones: Obama's A 'Swell Guy,' But He's Basically Just Like Bush". Mediaite. Retrieved March 27, 2013. ^ O'Brien, Matthew (January 8, 2013). "Everything You Need to Know About the Crazy Plan to Save the Economy With a Trillion-Dollar Coin". The Atlantic. Retrieved March 26, 2013. ^ Josh Barro (August 27, 2013). "Republicans Are Full Of It, And There's No Threat Over The Debt Ceiling". Business Insider. Retrieved September 11, 2013. ^ Sorensen, Adam (March 25, 2013). "The 140 Best Twitter Feeds of 2013". Time. Archived from the original on March 28, 2013. Retrieved March 26, 2013. ^ Brooks, David (November 19, 2012). "The Conservative Future". The New York Times. Retrieved March 27, 2013. ^ McMorris-Santoro, Evan (October 28, 2013). "Here Are Obama's Favorite Columnists". Buzzfeed. Retrieved October 29, 2013. ^ Byers, Dylan (February 24, 2014). "Josh Barro to join The New York Times". Politico. Retrieved July 28, 2014. ^ Gold, Hadas. "Josh Barro to return to Business Insider". POLITICO. Retrieved October 7, 2016. ^ Salam, Reihan (November 21, 2012). "Josh Barro on Why Republicans Resist the Reformist Project". National Review Online. Retrieved March 27, 2013. ^ Sullivan, Andrew. "Ask Josh Barro Anything: The Recent Evolution Of Conservatism". The Dish. Retrieved June 6, 2013. ^ Dreher, Rod. "Josh Barro wins the Wall Street Journal a New Subscriber". Retrieved 11 October 2016. ^ Klein, Ezra. "Josh Barro didn't leave conservatism. Conservatism left Josh Barro". Washington Post. Retrieved October 7, 2016. ^ a b Barro, Josh. "Why I left the Republican Party to become a Democrat". Business Insider. Retrieved 2016-11-14. ^ "Josh Barro Leaves GOP for Democratic Party: 'F--k It, I'm Out'". TheWrap. 2016-10-17. Retrieved 2016-11-14. ^ "Liberals can win again if they stop being so annoying and fix their 'hamburger problem'". Business Insider. Retrieved 2017-08-30. ^ Robberson, Tod. "Robberson: Red-meat Republicans have a point. Skip the 'venti' and give it to me straight". stltoday.com. Retrieved 2017-08-30. ^ "Hamburgers aren't the problem". Mother Jones. Retrieved 2017-08-30. ^ "The Left's 'Hamburger Problem' Is Not Going Away". National Review. Retrieved 2017-08-30. ^ "POLITICO Playbook, presented by BP – HAPPY FEC DAY -- LONGTIME BIDEN FRIEND takes Playbookers inside V.P. 's mind – NYT MAGAZINE cover questions government narrative about bin Laden killing – SPORTS FANTASY industry ramps up lobbying – B'DAY: Lis Smith". POLITICO. October 15, 2015. Retrieved October 7, 2016. ^ @jbarro (December 28, 2014). "Mentioning that I am an atheist seems to have led to a bunch of email trying to convince me of the existence of [a] god" (Tweet). Retrieved November 12, 2016 – via Twitter. This page was last edited on 17 April 2019, at 02:49 (UTC).